Last week, I received a call from a Sun on Sunday editor… who asked if we were responding to the crisis. I explained that because there hasn’t been huge loss of life, although extremely sad, this disaster in particular wasn’t high up in our priorities for finding orphaned children. After spending some time thinking about this opportunity, I realised it would be such a fantastic learning curve for me personally and in particular for our crisis response development. As our supporters, you will know we have been developing a crisis response team and working our way to a position where we will be fully empowered to respond. This has been a lengthy process, but each time I’ve had the opportunity to respond it has given me another layer of essential experience, preparing me for future team deployment. This trip to Antigua was fully funded by The Sun on Sunday and Virgin Atlantic, meaning that we were able to get 20 boxes of emergency aid to the affected children, without it costing us a penny! At this point I must say a huge thank you to everyone involved in making this possible. Thank you to the Sun on Sunday for covering the logistics costs. To Virgin Atlantic for allowing the cargo on the flight free of charge and for the incredible involvement and support from the flight crew. Thanks to Enterprise Ilkeston for pulling out all the stops to get us a van at short notice and Enterprise Gatwick for being flexible in allowing me to drop off the van at the airport. Of course, we would have no blankets to give if it wasn’t for our wonderful army of knitters and crochet crafters who have been busily supporting us. We are so grateful for this empowering gift, 6x4ft warm blankets are such a versatile tool to help those in need. 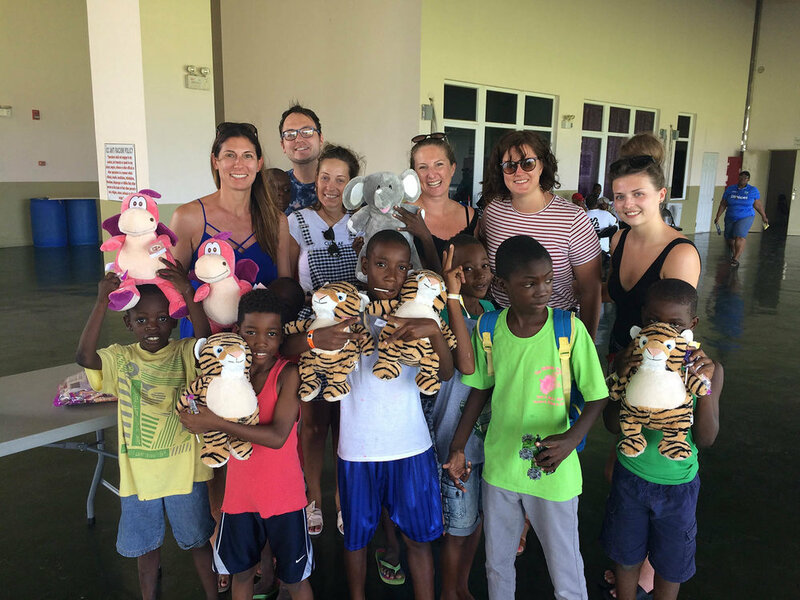 From Eastern Europe to the Virgin Islands, they have been a welcome gift and used to support in such a wide variety of circumstances. As well as giving beautiful handmade blankets and 100 family water filtration systems, I was able to meet other first responders and glean from their experience. I would like to thank Prahbat and the Brywnmawr Rotary club for the lifestraw family filters. They can filter 18000 litres of water, providing safe and clean drinking water for the affected families. These were donated to be used in Nepal, but as we were unable to get aid into the country we waited patiently for another worthy cause to donate these to. The people could not have been happier to receive these! While we were there I got to be part of the first International NGO briefing at the command centre. The situation across the region is devastating and so many people have lost everything. We heard of only one child death on Barbuda during the storm. People were holding their small children in the air as the storm sucked them up. I gave the Barbudan children living in the two government shelters their blankets and watched them as their eyes lit up. They cuddled into their new gift with such joy and we thankfully had enough blankets with us to give one to every child at both shelters. At night, the temperature drops and the cricket stadium’s air conditioning means that it’s so cold for them. I know these blankets will be a practical solution as well as a psycho-social benefit to them. Usually we operate on a tight budget, finding cheapest possible flights and staying in makeshift accommodation. This was a treat of an experience flying out on the first Virgin flight out to Antigua with a free upgrade and staying in a lovely hotel. Quite a different experience for this little NGO. It was fantastic to meet such wonderful people and feel a sense of togetherness in playing just a small part in responding to the crisis. Emma, the flight manager from our Virgin Atlantic crew was so moved by the situation she chose to fly back this weekend, especially to deliver some gorgeous Cubbies. These were recently donated to Operation Orphan and we are so grateful to be able to give the children something so lovely they can call their own. Photo credit to Dan Jones Images Ltd for these fantastic photos. If you would like to contribute towards our Crisis Response, which is still developing, please make a donation today. If you’d like to become part of our Keep a Child family, helping us to care for children who have lost everyone and everything, a few pounds or dollars per month will help us to build enough monthly income to support these children by keeping them healthy, safe, learning and warm.